We have over 300 different styles to choose from, starting at $2! Get inspiration from our idea books and samples or bring in your own ideas! Use our pens or markers, tape, stencils, stamps and rulers! Bring your own stamps or stencils OR bring printed designs or lettering to transfer. We have over 100 colors to choose from and all the brushes you'll need! All paints and glazes are non-toxic. We also have specialty glazes available for a small fee. Leave your painted piece with us for about a week and we will glaze and fire it! Your finished pieces will be food and water-safe and ready to be a part of your daily life! 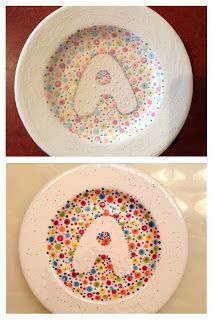 Here's a sample of our paints before and after firing! You only pay the price of your pottery plus sales tax!